This is from the old department store I. Magnin, by way of Birchhouse Vintage. I have to say, I've never seen something from this era with an I. Magnin label that I didn't covet. This dress would be mine, as well, if it weren't for that pesky "I don't have a 25-inch waist" problem. 1. An I. Magnin dress may not make a woman look frumpy, or, through being worn improperly, allow a woman to succumb to frumpiness. 2. An I. Magnin dress must be fashionable, except where such fashionableness would, in fact, be frumpy (conflict with rule #1). 3. An I. Magnin dress must be interesting, except where being interesting could conflict with #1 and #2. Do you think they had a poster listing these rules in the break room? I hope so. Of course, there is no I. Magnin any longer; they were eaten up by the horrible Macy's, the same chain that just ate Marshall Field's (and couldn't even get the signs right). This dress is mightily cute…and I must add that yes…Macy’s is horrible. So, so horrible. I LOVE I magnin clothing… always so well made. I thought I was the only one! Being a Chicago native, I am so very, very sad about Macy’s having eaten Marshall Field’s. I can’t come up with words for the sadness. They ate up Robinsons May too. Wasn’t a huge fan of them, but they were better than Macy’s.And I hate hate hate Macy’s. I suggest we Chicagoans take a page from the colonial boycotts of British goods and mock anyone carrying a Macy’s bag. Allow me to give some examples:”I see someone’s welcomes our new Manhattanite overlords.””So, shopping at G.U.M. again?” (When they express confusion, say, “Oh, well, the red star, the ubiquity–I keep getting the old Soviet state department store mixed up with Macy’s”)”When are you moving to New York?”Thanks a lot for destroying the last original great American department store. Assholes. Yes, the Macy’s juggernaut took over Seattle’s Bon Marche a couple years back, and tried to “ease” us in to the corporate takeover by temporarily calling it “Bon Macy’s” before lowering the boom and making it all Macy’s all the time. All of the shortcomings with no Thanksgiving parade to make up for it. Grr…That’s a glorious dress, though. I used to shop at I Magnin’s and longed for the days where I could shop there for everything, not just the little things I could afford at the time.Magnin’s was wonderful. I wish I still had a Magnin’s gift box tied with a pink Magnin’s bow. There is nothing like Magnin’s now. I feel oddly nostalgic about all the regional department stores being taken over by Macy’s. The Bon in Seattle and Hecht’s in DC are casualties as well, but I think I’m saddest about Field’s. I hear that Carson Pirie Scott is closing their State Street store as well. It’s all too bad.I do like the dress, though I myself am not quite ready for something so tweedy and fall-like. What a cute dress. I wish I still had a 25 inch waist. I remember I magnin we had one in Portland for a little while in the 80’s. I got to go in it a few times. I dont like Macys. I did not know that they bought Marshall Field’s tho Arrrag . They seem to be taking over the U.S retail. Is Macy’s part of May company if they are they are big. I beleive Macy’s is owned by Bloomingdales. Nice dress, and it’s in my size . . . hmm . . . must consult bank account. I do like that dress–very classy. Macy’s bought Rich’s in Georgia . . . used to operate both stores under different names but now they are all Macy’s. Local department stores had a real history with their communities. What a beautiful, classy dress! Macy’s bought Burdine’s here in Florida but now everything is Macy’s. Not that Burdine’s was so fabulous but at least they had different stock than Macy’s. Sadly, the US is becoming very homogenous. Actually I think it was Federated that ate everyone up and then spewed out Macy’s everywhere. Whether it’s Federated or Macy’s that’s doing it, they’re also swallowing up Foley’s down here. I had an aunt who bought most of my childhood clothes — and my first prom dress! — at I. Magnin in San Francisco. Going to I. Magnin’s was such an adventure…always wore a hat and gloves…and I can recall every floor — especially the seventh floor, which was toys and dolls. An entire room of elegant Madame Alexander dolls! It was not simply a department store, as your comments imply…it was a gracious way of life, elegant and civil. And Macy’s has eaten Wanamaker’s and Strawbridge & Clothier in Philadelphia, both of them historical institutions. 😦 It has been no gain for Philadelphia, that’s for sure. Macys. Ugh. I remember the day I. Magnin folded up, I wanted to wear a black arm band but instead I wept! Gone was fashion at it’s tasteful best. Macys still is the epitome of trashy, poorly made clothing. I. Magnin PLEASE COME BACK! I spent many hours of my youth at I Magnin & Co. We were 4 sisters and one brother, so the girls were dressed often from Magnin’s, and my brother from another store of the past – Young Man’s Fancy, in Laurel Village.I remember the 7th Floor – got my Senior Prom dress there at the after Christmas sale – $12.00 – still have it, just can’t fir into it anymore. The sales ladies were dolls, and VERY helpful. I can remember shopping at a sale one day, and waiting for Dad to pick us up after he got off work. We had figured how much we Saved that day – and cheerfully told him! He urged us to not try quite so hard, as you had to spend $$ to save $$.there was a toy department with books, which entertained Dad while he waited for us. The madame Alexander dolls were exquisite!I do have a few pink and gold boxes, and I treasure them! 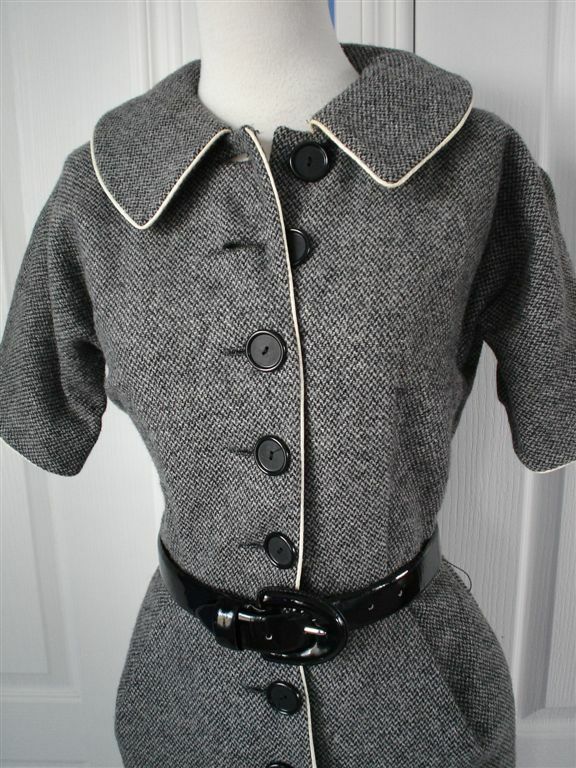 There is a listing for a beautiful I Magnin dress on ebay – if I could still wear a mini – I’d buy it! I have read that the Magnin family wanted to bring I Magnin back but the creep Lundgren that runs Macys started a cheap lingerie line at Macys called I Magnin so the copywrite would still be theirs and blocked the family from bringing the fabled elegance and fashion back. I used to shop at I. Magnin in La Jolla when I was in high school, also at Joseph Magnin. I bought two of my prom dresses from those stores, slinky, pretty gowns (none of those pouffy, frilly dresses for me). Live on Maui now, all we have for dept. stores are Sears and Macys (used to be Liberty House), hows that for selection? Ms. Bee: As a native San Franciscan, I remember so well shopping @the BIG stores w/ our Mother downtown SF. The W-house, T-City of Paris, etc. I am one of the REAL VINTAGE collectors of Genuine VINTAGE clothing, purses hats,etc. (I actual wear many ) I Love this dress and I am so glad I kept (In excellent condition) most of our Moms I.Magnin purchases. If I had the patience,Id put them on e-bay. i absolutely loved I. Magnin. I shopped in the Seattle store from the ’50’s until 1976 when I moved to San Francisco. I could always depend on them for quality, good taste and value – and wonderful service. One outfit I tried on in Seattle (in 1969) was one size too large. I was leaving for Hawai’i two days later and wanted it for the trip. They called S.F. who had the smaller size in stock, had it shipped up over night (before fedex, etc). It didn’t matter that it might not fit and was a sale item. It wasn’t the only time I got exceptional service but just one example. Macy’s is no better than a high price Target. One store in California even moved all the registers from each department and lined them up at the escalators – and brought in carts. With that, of course, not even that ONE employee per dept. Does anybody remember the soap sale at I.Magnin’s??? It only happened twice a year. All the ladies that worked in the Cosmetic department had to help getting the soap from the stock room and bring it down to the sales floor. We then stacked in on long tables set up in the Cosmetic department for the customers. People loved this soap. We even got phone orders from customers that lived out of state. They would buy enough to last them until the next soap sale. I worked for I.Magnin’s in Oakland as the Chanel Counter-Manager in the late 80’s to early 90’s. Of course I got totally spoiled by Chanel cosmetics and fragrance. Stores like this are now a thing of the past and I.Magnin’s was in a class of it’s own!! Does anyone know if the soap company that made the wonderful I Magnin soap is still in business, and what the name of the company is (or was)?